Meet the horses & hu﻿mans that help make the Center for Adaptive Riding a wonderful place! Tang is a our Belgian Quarter horse cross. Belgian Draft horses are the most popular draft horse breed in the United States - they outnumber the rest of the draft breeds combined! This isn't surprising, given their calm, even temperament, and versatility. Tang joined us in March of 2016, and is about as sweet as they come! She lights up any time someone comes to visit her, and always has a smile on her face, no matter what she's doing. ​Sully is the newest member of our herd. 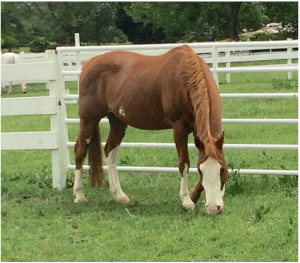 He is a nine year old Quarter Horse who competed in barrel racing and team roping in his earlier years. He is one of the sweetest souls who loves to be around humans and horses. He is sure to take care of anyone he meets. ​Flash is a quarter horse born and raised in Northern Nevada along with her brother Kit. She is a performer, whether in the show ring or working cows. She is athletic, sweet and the consummate professional when it comes to carrying our riders. Macho joined our group in November of 2016. He is a miniature horse, measuring in at only 32" tall! Miniature horses are known for being friendly and interactive, and are commonly used to pull carts. Macho is loves people, is very well trained in driving, and has a slew of fun tricks up his sleeve! He has a lot to teach his students. ​Susie is one of our Halflingers. Halflingers are popular in therapeutic riding and vaulting due to their shorter height, stocky build and smooth gate. Susie loves an easy ride on the trail and hardly bats an eye at anything you throw her way. She never misses a meal and will always greet you at the gate! Nikki Avera is our newest team member, joining us as Program Director, Equine Manager, and Lead Instructor. She is a fifth generation Nevadan who grew up on family ranches falling in love with horses from an early age. Throughout her younger years Nikki and her horses participated at local shows. In high school, she discovered her life’s biggest pleasure through an internship; equine assisted therapy. In 2014 she graduated from the University of Nevada, Reno with a bachelors in Social Work. After years of volunteering at local therapeutic riding centers, Nikki completed the Instructor in Training Course at High Hopes Therapeutic Riding Inc. in the fall of 2017; where she completed a life goal and became a PATH Intl. Registered Therapeutic Riding Instructor and Equine Specialist in Mental Health and Learning. When she is not riding horses, Nikki also enjoys hiking with her dog, traveling, and spending time with family and friends. ​A special thank you to one of our amazing volunteers, Angela! She has committed time nearly every week to work with our horses and we are so grateful for all she does! Cindy Salyer is our interim Board President. Lora Tedesco is our Board Treasurer. ​ Lora and her husband Greg have owned and operated their Construction Company in Reno Tahoe since 1984. She grew up in Rural N Cal riding mostly neighbor’s horses before school. Her Sister Linda, recently passed, was mentally and physically disabled, so she understand how a program outside of the home interacting with animals can enhance the lives of these students and veterans. She joined the board to help maintain this important program and give support to an organization facing many challenges. ​She enjoy gardening, hiking with her dogs, reading and exploring our country with her husband. Romeka Karam is our Board Secretary. ​Romeka is a Special Education Teacher for Washoe County School District, working specifically with students with Autism. She received her Masters of Teaching from the University of Virginia in 2012 and has worked in a variety of special education settings since. She will obtain her Autism endorsement in spring of 2019 from the University of Nevada, Reno. ​As a child, Romeka always found her time spent with horses to be rewarding. Volunteering for an adaptive riding center in Virginia was an ideal setting where Romeka could combine her passion for teaching students with special needs and spending time with horses. Romeka became a volunteer and a board member for CAR in 2017 and is currently pursuing her PATH Instructor Certification with the help of the amazing instructors at CAR. ​In her spare time, Romeka enjoys spending time wither husband and two-year old son. Cindy is a veterinarian who specializes in hoof care. Not only does she trim all of our horse's feet, but she regularly gives us valuable advice on the nutrition and diet of the horses. Cindy graduated from University of Pennsyvania Veterinary School in 1987. As the owner of Founder Warriors in Northern Nevada, Dr. Nielsen's practice is currently limited to equine hoof care including barefoot trimming, problem hooves, lameness and Epona shoes. Donna Hyatt is a certified coach focusing on business systems for the small business owner. She grew up in Montana and loved riding her Morgan/Quarter Horse, Red, all over the countryside. It was a special time and place to grow up! Donna is proud to be a part of the CAR team and to have a chance to hang out with the horses and wonderful volunteers!